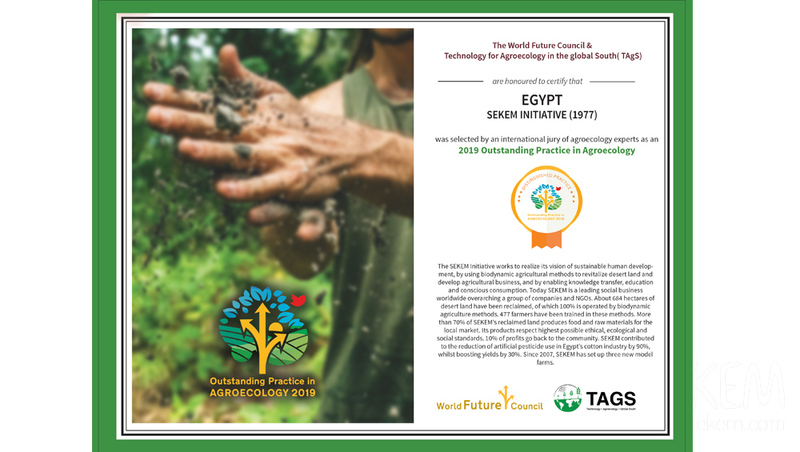 SEKEM was announced by the World Future Council as an Outstanding Practice in Agroecology 2019 advancing the transition towards agroecology from the global South. For its leading role as a social business worldwide, the Egyptian Initiative received this recognition among 15 best practices, beating 77 nominations from 44 countries across Africa, Asia and Latin America. “The Outstanding Practices in Agroecology 2019 create immediate and real impact and if executed at scale, they can help to considerably transform our food systems,” says Prof. Dr. Franz-Theo Gottwald, Supervisory Board Chairman of the World Future Council. Organized by the WFC and the start-up Technology for Agroecology in the Global South (TAGS), this honorary recognition comes on the occasion of the International Green Week and the Global Forum for Food and Agriculture 2019 hosted in Berlin. In this context, the 15 best practices will be presented at the event “Scaling up Agroecology! For Forward-looking Decision-making in Policy and Practice”, on 18th of January 2019. For more than 40 years, SEKEM has been advancing transitions towards agroecology in Egypt by reclaiming around 700 hectares of desert lands, using sustainable biodynamic agriculture practices. The Initiative serves the local market with minimum 70% of its yield as food or raw materials. With its activities, SEKEM also fosters social and cultural development to all its community members. “By such recognitions, the World Future Council encourages the world to further steps for teaming up in order to achieve sustainable livelihoods across the globe,” says Helmy Abouleish, SEKEM’s CEO. SEKEM Founder Ibrahim Abouleish had been engaged as a counselor of the World Future Council since its foundation in 2007. After his death, his son Helmy Abouleish took over his role.